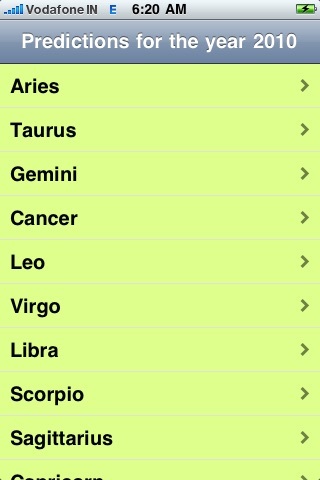 You can know your fate (future) for this year (2010) with this app. 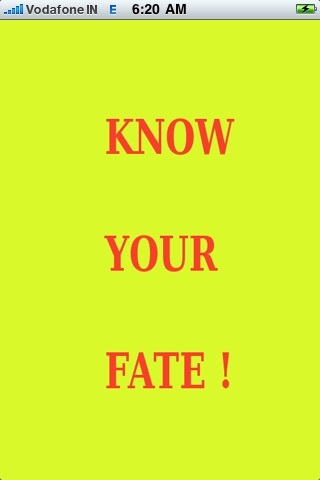 Fate is somewhat a complicated subject, some believe it and some don't. Although from my personal experience, there is something which is present in fate that happens frequently and you can only think that it could not have been a coincidence. There is a science just like physics and biology in fate, which if told correctly and analyzed according to its mathematics; can reveal many unseen facts that are going to occur in your life. Your fate can also be accurately told if the exact date and time of your birth is a factor in the analysis of your future (fate). 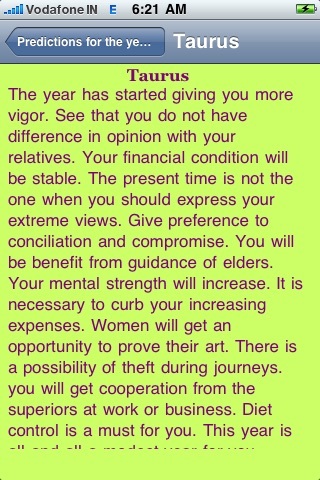 I have acquired generalized readings of the year 2010 for all sun-signs from a very gifted fortune-teller that has personally told me things about my life that at an earlier point in time I was unaware of, and which happened anyways up to this point and I still keep getting amazed as the rest of the predictions keep happening. This app has been tested for iPhone OS 3.0, iPhone 3G, 3GS and iPod touches.